FTD Eternal Affection Arrangement is a peaceful offering of heartfelt sympathy. 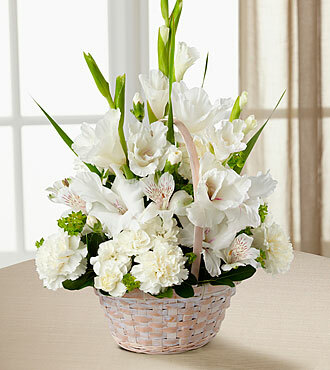 White gladiolus, Peruvian lilies, carnations, mini carnations and lush greens are beautifully arranged in a round whitewash handled basket to create a beautiful display of soft serenity. Approximately 20H x 15W.